Another new family farm in the Shenandaoh Valley... learning as we go and loving it! 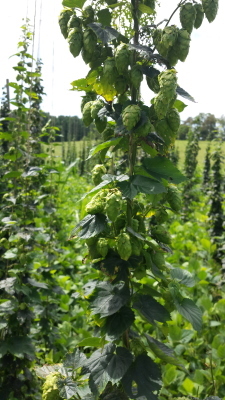 We'd been wondering what kind of crop we should grow on our land, and with a little bit of research to confirm that we had excellent soil and the ideal terrain, we jumped into hop growing with all the enthusiasm of the naive idealist! We tilled and fertized in the fall of 2014, and again in early spring 2015. Hops need lots of nitrogen so we added "green manure" plus lime and other minerals to give our hops the best start possible. 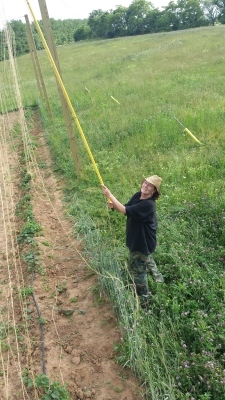 ​Then the heavy lifting began - constucting the trellis. We dug dozens of footers, erected the 18' poles, and hung and anchored the cables. After that, planting 360 rhizomes was relatively easy! Fortunately, the trellis is strong and the rhizomes will continue to produce hops for 15+ years, so no year will ever be as hard as the first. 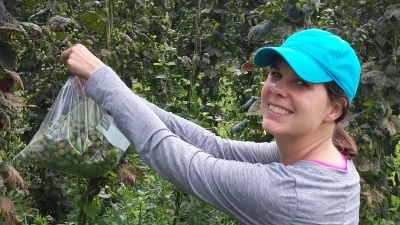 With some expert help from Stan, ODHC, county extension agents, and the Virginia Tech hops testing lab, we had an extraordinarily healthy and abundant first year harvest (80+ pounds wet) from our ¼ acre yard, all with organic fertilizers and soil amendments. In 2016-2017, we were nearly overwhelmed with the harvest. 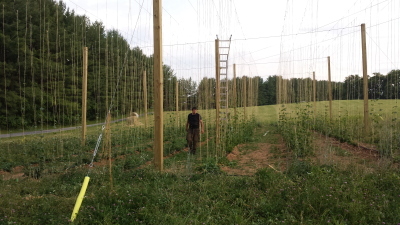 With the help of family, lots of friends, and a harvester, we picked well over 200 pounds of hops. ​We gave some away and sold the rest (mostly wet, some dried) to local craft breweries. 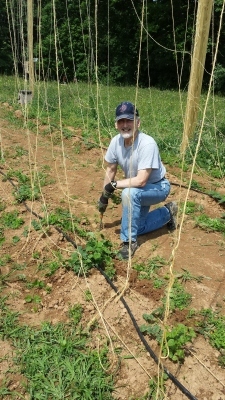 hops usually - could be 300 pounds this year! ​We really hope you'll join us! Untangling strings after letting them blow around loose too long... another lesson learned the hard way! Training the baby shoots to grow up the strings - impossible without awesome friends!